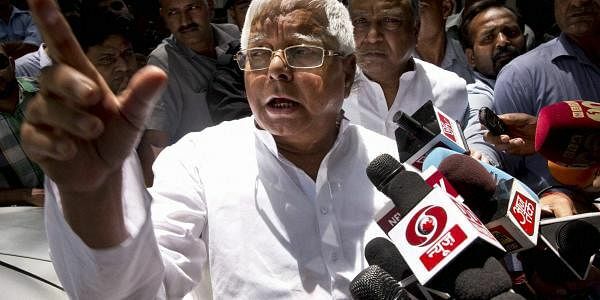 JD chief Lalu Prasad Yadav and his younger son Tejaswi Yadav, who is the deputy chief minister of Bihar, on Thursday took to twitter to slam the Narendra Modi government. PATNA: Determined to intensify the fight against BJP further, RJD chief Lalu Prasad Yadav and his younger son Tejaswi Yadav, who is the deputy chief minister of Bihar, on Thursday took to twitter to slam the Narendra Modi government. home Kiren Rijuju for some of the comments the latter had made recently. “Modi has turned the country a football. He kicks it to a side, some ministers kick to another side, and other ministers kick it to yet another side. RBI and the finance ministry have their own kicks,” wrote the RJD chief, who has been openly skeptical of the demonetisation move since the day it was announced by the prime minister on November 8 evening. of curbing Black money, Terrorism & fake currency were anthr Zumla's. Modi Ji u guys r running country not playing football”. In the third tweet of the day, the RJD chief offered the prime minister some stern advice. “Stop hitting the dust with a stick. Run the country after stepping out of the frame of narcissism and self-publicity. Do not destroy the poor masses,” wrote Yadav. Tejaswi Yadav targeted Union minister Kiren Rijiju on the latter’s strong reactions to allegations of corruption worth Rs 450 crore in the construction of two dams in Arunachal Pradesh. “Come to our state Bihar, Rijijujee. We will feed you litti-chokha. Stop violence, wielding lathi and shoes. Let us together promote unity and love,” wrote Tejaswi. “Why is it that all the black money is being seized from BJP leaders? Modijee, first sweep your own backyard”.